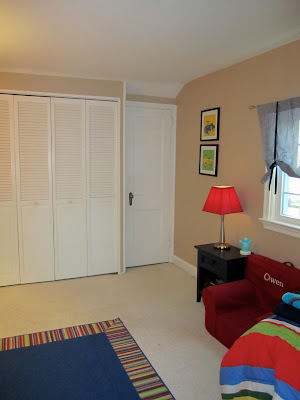 On Tuesday, I gave you a tour of the downstairs rooms in my home. Up today: we're heading up the twelve stairs to the three bedrooms and full bath. Our bedrooms are all pretty generously sized with lots of great natural light. 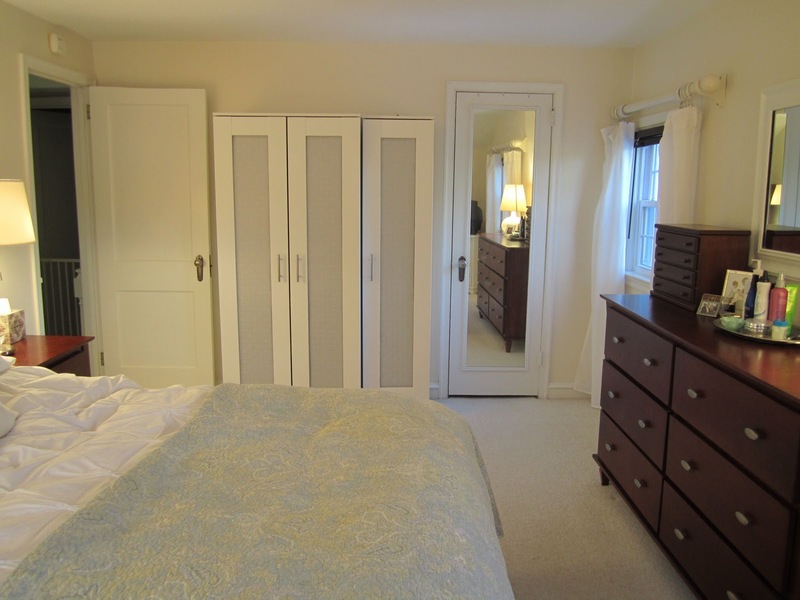 Two of the three rooms have kind of small closets, but that's what you get with an older home. 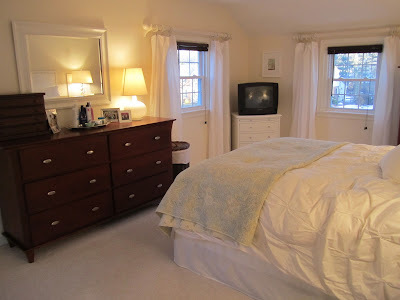 Master Bedroom: When we moved in, the master was painted that same darn pastel green as in the living room downstairs. 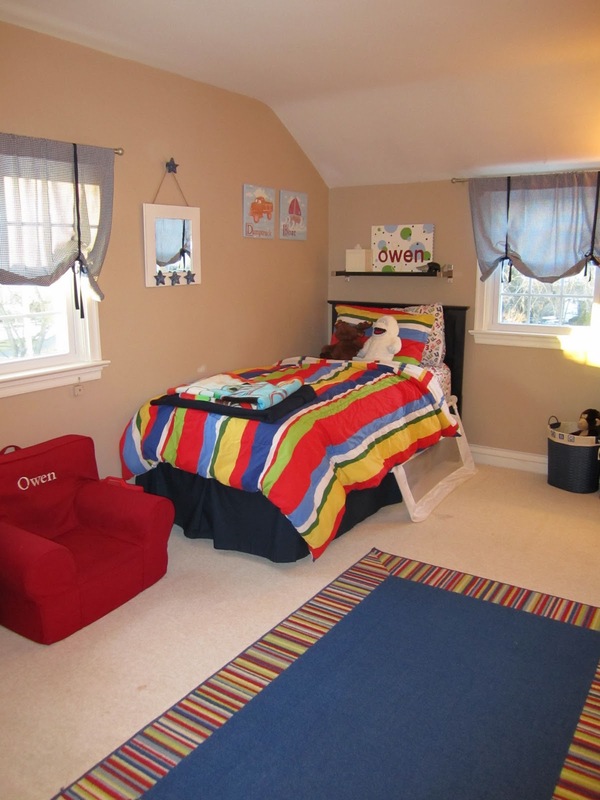 This was the very first room I painted - both in the house and in my life! I always recommend to friends and family that when they move into their new homes, that they tackle the master bedroom first thing. It's your sanctuary, and if you start on the more "public" areas of the home, it's unlikely that you'll ever get around to the bedroom for some time. Anyway, digression aside, I painted the room a soft cream called Cottage White by Behr. It's served me well for 6 years, but I have plans to paint the room a light gray. I made an upholstered headboard, brought in some free-standing armoires for more closet space, added lots of white accessories and bedding and voila! 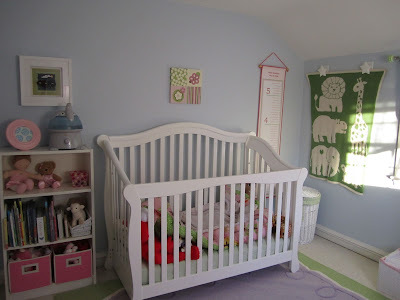 Little's Room: Little's is the smallest of our three bedrooms. 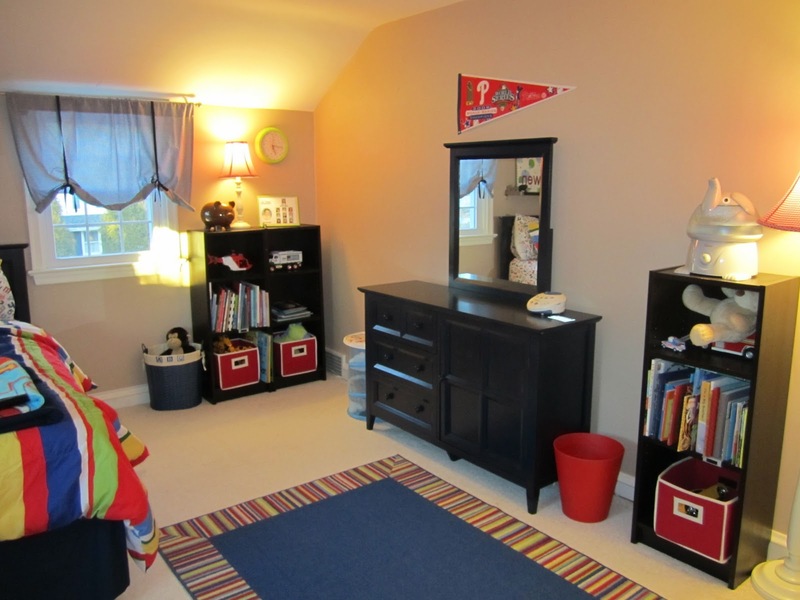 When we moved in, it was the owners' three-year old son's room, and they let him pick the color. Danger. It was a super bright blue. 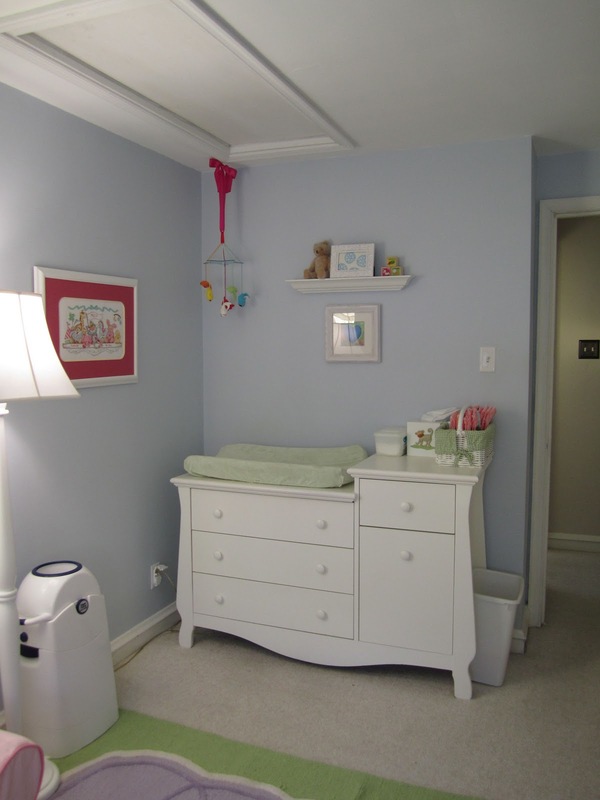 When I was pregnant with Big, this room became his nursery, and we painted it a soft icy blue called "Icelandic" by Sherwin Williams. I liked that it could work for a boy or a girl. 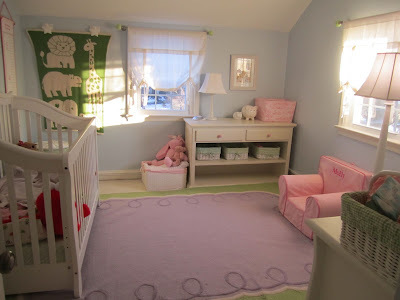 Now, it is Little's room and still has that hue on the wall and I've brought in light pink, dark pink and green as well to make the room more girly. Big's Room: Big's room used to be the former owners' 7-year old daughter's room, which was painted a soft yellow. Of all the colors in the home when we moved in, I probably liked this one the best. But when I was pregnant with Little, we had to move Big over to that room, and soft buttery yellow just wouldn't cut it. We repainted it "Practical Beige" (don't you hate boring paint color names? what's the point? ), which is just OK. It's a little muddy on the wall, but it will do for now. I went with primary colors for Big's room: mostly reds and blues with a few pops of green and yellow. Full Bathroom: Mercy. Our full bath is clean and bright, but it is small. There's no way getting around that fact. 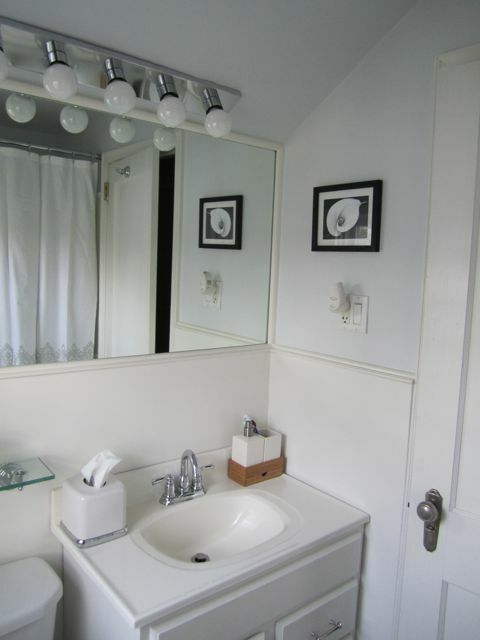 The former owner put up white wood wainscoting, which makes the room look crisp and clean. 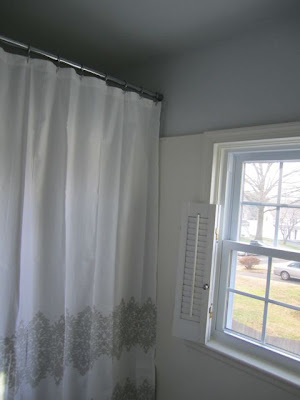 They had painted the room red, which I immediately painted over with "Smoked Oyster" by Behr. I am on the brink of redoing this space - I plan to repaint the walls an icy blue with a lot of white in it (in fact, it's on the same paint chip as the Icelandic in Little's room, so I know it will flow nicely). I also plan to rip out the shower doors that we have - they are functional and totally clean, but I hate them, especially because they're trimmed in brass and we've since replaced all the old brass fixtures with a sleek polished chrome. I'll put in a shower curtain, buy new towels and get an over the door towel bar for extra storage. Woo hoo! Edited: The shower doors are no more! Here's the space now. 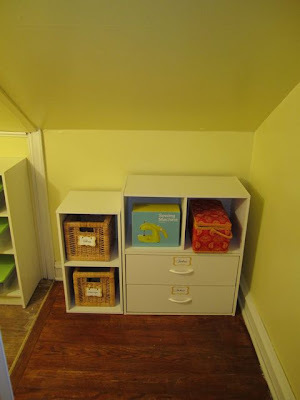 Storage Closet: I don't have any pictures of this space because it is in the embarrassingly awful "before" state right now. In the back of Big's room, there is a pretty generously sized storage closet. 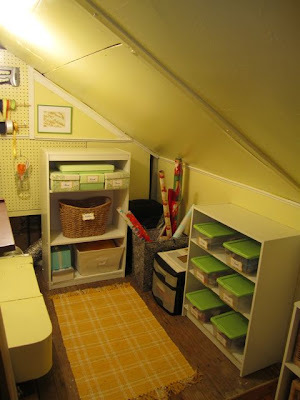 I'm going to paint this space, hopefully bring in a light or two, and turn it into a combined storage closet/craft room. I promise to post before & after pictures as soon as that project is under way. 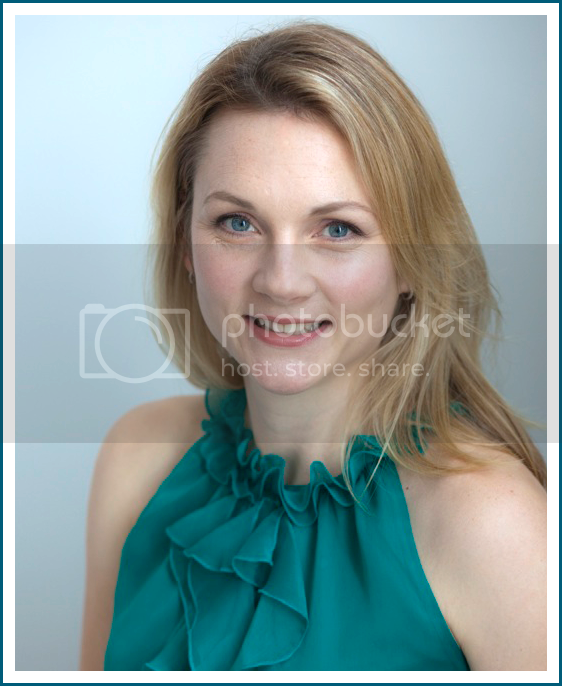 Edited: Here are the after pictures! I adore my little craft room now. I hope you enjoyed the virtual tour of my home! For the most part, the home is "done" - and I'm left to work on little projects that make the space more fun and useful. The next year+ that I live here will be devoted to these smaller projects (which also include tidying up and organizing our outdoor storage/garden shed and painting the floor & walls of our garage). Lots to do ... lots to paint! 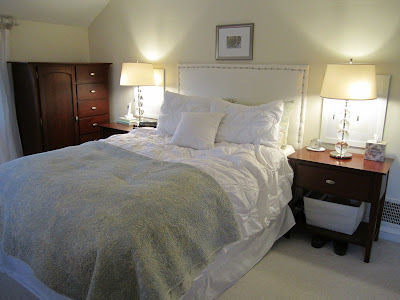 Love love love the West Elm bedding! It really works in your bedroom. Thanks heather! I love the bedding! It is pretty and super comfy. Would you give a gift card? Home Swoon Home: Hot Hot Hot!